Stay at home moms/dads vs. working moms/dads. Who has it harder? The honest answer is that we all do. I have yet to meet a parent who would describe parenting as easy. And if that parent does exist, could you be a doll and come over to my house around 5 p.m.? I could really use an extra set of hands. We are all trying to do the best that we possibly can. It is as simple and as complicated as that. Whether you work outside or inside of the home, chances are that you have had to justify your decision to someone. Or at the very least, or shall I say, most, you have had to justify it to yourself. We have had to convince ourselves that whether or not we receive a paycheck, that what we are doing is the best choice for our children, our partners and our lifestyles. Shouldn’t we be the best judges of what is best for our own families without the criticism and judgment of society? Or worse, to hear that harsh discernment from our dear amazing, hard-working and rarely ever thanked fellow mothers? If that is the case, then momma really does not know best. I have had the joy and sacrifice of staying at home over the past 8+ years with our four children. One thing that is an absolute reality- there have been days that I would have given at least three of my limbs to have been able to trade places with my husband and work his excruciatingly stressful career (in particular, after our twins were born). The other reality is that I know that there are moments that he would do the absolute same to trade places with me (in particular, the one future day that the twins will be in school). Both jobs are beyond challenging and the argument of who has it worse is beyond exhausting. What if instead of focusing on the grunt work of it all, that we focus more on the pure joy of it all? What if we focused our energies on supporting one another and being there to unleash to one another when we’ve had a crazy, hide in the bathroom-because-it-has-a-lock type of day? We teach our children to love and respect one another, regardless of gender, race or religion. So it is now time for us to do the same for each other, to show the respect we so deserve, regardless of job status. Whether running the boardroom, the bedroom or the PTA, chances are the parents in our lives are bending over backwards for someone else besides ourselves. Instead of questioning how we are or are not utilizing our degrees, maybe we should thank one another. Or at least, offer each other a glass of wine. Without doubt or question, we have both earned it. So what was the only thing that he requested on while his high fever caused him to not have any desire to eat but need to lay the day away? As he named it, "The Niko Special" and luckily for me, it really couldn't be any easier. I don't know if it was his special smoothie or the amazing immune system of a six year old but the next day he was running the day away. I don't know about you but I am beyond ready for warm. Yes I know that spring is around the bend and I see some buds a blooming but right now my little toes will be at risk for frostbite if I attempt to wear flip flops outdoors. Let's celebrate these last few days of freezing February by giving away some happiness shall we? One giddy winner will receive a signed copy of my brand spanking new and motivating journal AND this sold out, limited edition Stella & Dot "shine" bracelet, that is not only easy on the eyes but also raised thousands for Autism Awareness last spring. So naked momma, you ask, how do I win these lovely gems? It's simple my friends, all I ask is that you share. Share by clicking that sweet little facebook icon below and then just let me know by commenting that it has been shared either below or on my facebook page (www.facebook.com/katieyackleymoore). Don't have facebook? Please feel free to share by e-mail, text or pony express. Just don't forget to let me know that you did so you can get gratitude, kudos and an entry in the contest. But what should I say? Anything you fancy, I just ask that it is positive and mentions the journal (or you can just copy the link below). It is my fifth babe after all, I want the whole world to know that it has arrived. This is one of my YTT students from way....back - Congrats Katie. I have my own copy - you should get yours. We all need a little encouragement to unleash our potential. So I feel more naked and exposed now than I really ever have before. The frightening, revealing and exhilarating part in being a writer is putting yourself out there for the world to open. I could have procrastinated over soy lattes and red wine for a few more years but the time feels like now to take a step forward in a new chapter of writing. Outside from a notebook and the safety of a computer and release my words with the high hopes that they will awaken someone else. I can always drown myself in espresso and wine later. My fifth baby has arrived and I know I'm partial, but she is gorgeous. 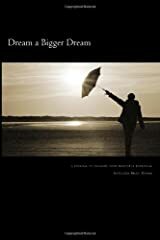 Dream a Bigger Dream: a journal to unleash your beautiful potential is here and ready for your pen to decorate its happy pages. It makes a great gift for someone you love, a graduate, a friend, a sister. And you. We all deserve the biggest dreams possible. It all just begins with opening. So you would like to give green smoothies a try, but you are a little afraid that your final concoction is going to end up tasting like say... dirt? Never fear my dear one. Drinks that are amazing for you, need not taste amazingly awful. This is my basic recipe for a green goddess smoothie that you can play with with what you have on hand in your kitchen. Consider it a baby step (or give yourself some credit, a giant ginormous leap) in the direction of getting more green in your machine. I have a confession. My name is Katie and I watch The Bachelor. Every Monday night. And then comes The Bachelorette. I avoid The Bachelor Pad not because of its (crass) content, but because of the timing of its season; my children stay up way too late in the summer months for me to squeeze it in. Watching this reality television love show is my guilty pleasure and I have decided that I am not going to apologize for it. At the risk of sounding ridiculous in the way I spend my time, I also do a live blog with some fun and fascinating friends that make hilarious comments throughout the duration of the show. We comment on everything from the contestants choice of cocktail dress ("they need dresses that are actually in their size") to how we prefer our cupcakes (Joe thinks that frosting today is way overboard, Kara disagrees) and the details of our personal lives (the good, the bad and the insanely funny). Through a reality show, we found a community to cultivate the reality of our own lives. As a yoga instructor it would seem that this might not be one of my most adored ways to spend a free evening. But it really is. This is the type of unexpected twist about someone that I thrive on discovering. I applaud that my sister-in-law, a CFO, CPA and all around amazing financial guru watches every season of Big Brother. Her husband, a police officer is addicted to it too. My inspiring and beautifully zen yoga mentor used to tape General Hospital on a daily basis. I know of a yoga master who conducts national teacher trainings and could walk through life in a handstand, eats regular, full fat, old-fashioned, non-soy ice cream. Nightly. I am witholding their names just in case they do not want their identities revealed. Just in case they do not want the world to know these intimate details of their character. The question though is why do we feel the need to hide these desires in our lives that make us all the more human? Is it because we don't want people to judge what we do behind closed doors or is it because we really flourish on having a secret, something to call our own that can not be revealed by a first impression? I say we embrace what makes us human. Reveal the guilty pleasures, the confessions, the messy closets (I have plenty of those too). Let's set ourselves free from perfection or society's ideals of what idealism is supposed to be. In my eyes, that makes you all the more real, and that is a quality far greater than perfection. We are all beautifully flawed human beings. At the end of the day, that is who I want to drink a glass of wine with. Ideally, while watching The Bachelor. So it seems like it is about time for a new chapter in my life. One that includes wellness and writing and random thoughts about parenting and life, dusted with happiness and occasionally a little sprinkle of snark. You know, the raw and honest way of being. I am not aiming for perfection by any stretch of my being. Most days I'm really just trying to make it by floating with my head above water, my four young children still breathing and my husband not upset at how much I spent at Whole Foods. That is a great day and this is an amazing journey of glorious imperfection that I would love for you to join me on.